Looking for climbing helmets? Check out our Buyers Guide! A tour through the mountains holds many dangers and risks. From ice and falling rocks to falls, drops and falling equipment, accidents are always just around the corner. Modern climbing helmets protect the head, provide safety and prevent accidents, so that your climbing adventure is not overshadowed by injury or even worse. A climbing helmet is simply an essential piece of equipment for all climbers. As the saying goes, "the brain is the most important muscle for climbing". What can I expect from a good rock climbing helmet? Good climbing helmets must meet some important requirements in order to protect the head as effectively as possible. Climbing helmets should fit well, so as not to interfere with climbing. Comfort is often underestimated, but climbing helmets should not only be safe, but also comfortable. A helmet pressing against your head can take the joy out of even the most beautiful climb. An absolute must for any climbing helmet is stability. In a worst case scenario a helmet may be needed to save your life, so a high degree of safety is essential. All helmets have to undergo standardized testing before they can be approved as a climbing helmet. A five-kilo weight is dropped on the helmet from two meters. This ensures that the climbing helmets can withstand a specific drop. Climbing helmets are also checked for their impact resistance from the front, from behind and from the sides. Only when a helmet passes these tests, is it approved for the market as a climbing helmet. What types of climbing helmet are there on the market? First up there's the hardshell climbing helmet. 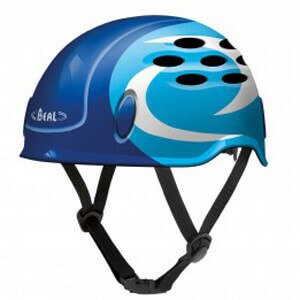 As the name suggests, these climbing helmets consist of a hard outer shell. The shock-absorbing effect is carried out by a system of straps on the inside. Hard foam helmets are a real lightweight. The foam deforms upon impact and absorbs the energy of the fall, similar to the crumple zone on a car. The hybrid helmet combines the properties of hard foam and hardshell helmets. These climbing helmets have a thin outer shell and shock-absorbing foam on the inside. Then there's climbing helmets for women and even climbing helmets for kids. With any type of helmet, it should be replaced after a fall or coming into contact with falling rocks. Only then can optimum protection be guaranteed!